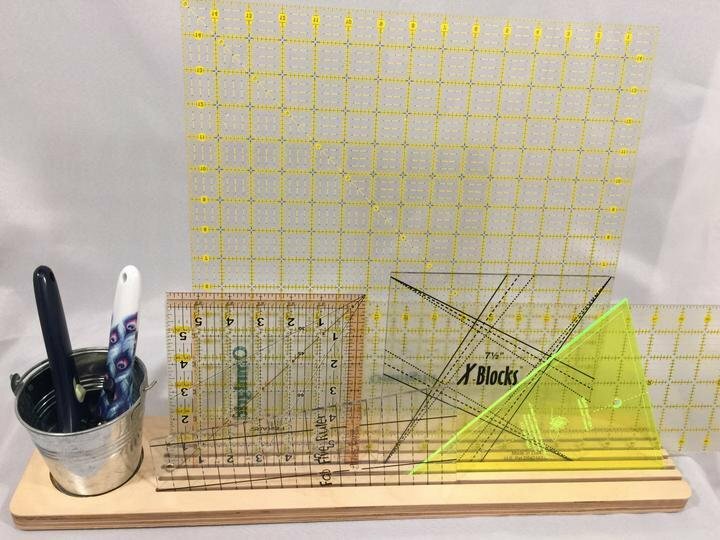 This wooden ruler rack will organize your rulers and keep your cutting area neat and tidy. 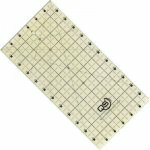 The sturdy wooden base has a generous six slots that allow you to sort your rulers and templates according to size, keeping them visible and handy. Unlike other ruler racks this one features a galvanized farmhouse style bucket to store cutting tools for safety and a clutter-free work area. The bucket is not attached if you would prefer to replace it with a container of your own choosing. Non-skid discs on the bottom of the base prevent the rack from moving or slipping. Measures 23” x 4.25” X 5/8” The opening for the bucket is 2 7/8” in diameter. Enjoy Video by Joyce Haskins, inventor of the Lap App!